In recent times, the school cafeteria has gone much beyond it's routine function as an enclosure for food and snacks for students. Given the progress of digital software and its impact on signage menu boards, the school cafeteria menu board doubles-up as a display screen for a myriad of information, updates and entertainment. With the impassioned digital age enveloping the socio-economic fabric of all countries, and the US in particular, the schools and educational institutes too are vigorously deploying digital menu board/screens - for their valued amenities, including their cafeterias.We focus here on the various facets of the digital menu board placed inside the school cafeterias. School cafeteria digital menu boards can market all varieties of food, from vegetarian to International cuisines. These digital menu board displays are a welcome sight for the tech-savvy and digitally-fueled young students of today. Digital menu boards, while mentioning the nutritious properties of food items, make it easier for students to make informed decisions by offering healthy and nutritious food. Given a sufficiently large and committed target audience, the cafeteria can earn revenue by offering students the food items they like and prefer. Digital menu boards, with their visual appeal and Playlists, can promote - a variety of food items at different times of the day ie, Breakfast, Lunch, Afternoon snacks and Dinner. Digital menu boards provide opportunities for local advertisers and nutritional food manufacturers to promote their products to a captive student audience. Digital menu boards enable quick menu updates for different meal times as well as facilitate item up-sells for generating additional revenue for the cafeteria. Given their visual appeal, digital menu boards are effective in catching the student's attention on the food offers of the day. Also, effective for recall and retention. Digital menu boards decreases the waiting time for students who can order their meal quickly, eat with classmates and friends, and then proceed on their curriculum. 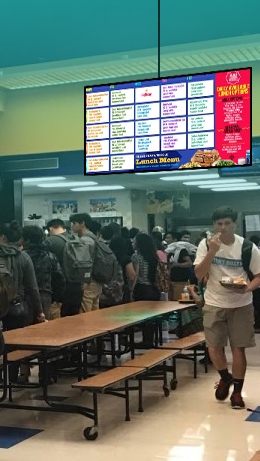 The cafeteria menu board can double-up as a screen for displaying a plethora of imformation pertaining to the students who form a captive audience. The digital screen can rotate entertainment and information along with the food menu. Since virtually all youngsters love watching fun-filled animations and videos on a digital screen, the school authorities can run visually appealing content customized for them in the cafeteria. Hence , the cafeteria is the ideal place to engage with students informally. Schools are one of the institutions who make announcements and communicate with students all the time. The school can convey rules, regulations, safety measures, emergency alerts relevant for students at appropriate times through the cafeteria digital screens. The content on the cafeteria screen needs to be updated regularly in order to sustain and retain the student's engagement. Out-dated news and information needs to be replaced by fresh ones. The school can even engage a senior student as a content writer and developer. Cafeteria digital screens could be used as a calendar for ensuing events ie ( curriculum, sports, debates & contests, athletics, music, and all other extra-curricular activities ), informing and updating students all the time. Cafeteria digital screens are a great way to announce students achievements. As the picture of the student flashes on the screen, the student is ecstatic at being felicitated in the presence of his friends ! A fantastic way to motivate and boost confidence. Digital screens in cafeterias can also run advise attitudes and behavior. The content can be conceived in an appropriate way to inculcate students proper behavioral codes to be adhered within the school premises, and even beyond. Digital screens in cafeterias can be a powerful tool in announcing Birthdays, Graduations and Celebrations. There is no better joy than to hear a hall full of students singing 'happy birthday to you' at my son's birthday announcement, or the enthusiastic cheering and clapping when my son's academic success is announced on the digital menu board in the school cafeteria.